Dominik Panka -- PCA Main Event Champ! 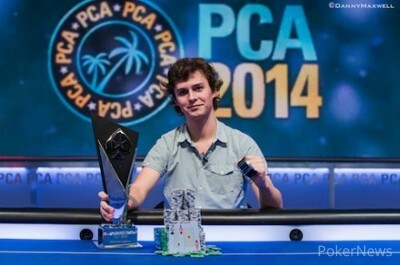 Finally, after a grueling, 16-hour day, Dominik Panka is the 2014 PokerStars Caribbean Adventure Main Event champion. Panka, who now leads the Polish all-time money list, reached heads-up play against Mike McDonald, winner of the European Poker Tour Dortmund in Season 4, and denied the Canadian his second title on the EPT. Through 95 tour stops, no player has ever won two EPT titles. Panka and McDonald made a three-way deal with American Isaac Baron. All three players earned more than $1 million. Panka earned $1,423,096, along with a “Steel and Black” design SLYDE watch worth €5,550. During the first three hours of play, none of the eight finalists were eliminated. McDonald took the chip lead away from Muur and extended it by recording the first knockout of the day. Fabian Ortiz, who finished 17th in the World Series of Poker Main Event this summer for $357,665, four-bet shipped with the , and McDonald, the three-bettor, called with the . The wired pair held up, and the Argentinian hit the rail in eighth place. One hour later, after Muur retook the chip lead, he and McDonald played one of the most important pots of the tournament. McDonald raised on the button with the at 30,000/60,000/5,000, Muur three-bet to 310,000 out of the small blind with the , and McDonald put in a four-bet to 700,000. The Estonian didn’t back down, five-betting to 1.275 million, and McDonald moved all in for 6.73 million. Suddenly, there were over 8.1 million chips in the middle, and if Muur called there would be over 13 million — no other player had more than 5 million at the time. Muur eventually folded his hand face up, and McDonald took a 2 million-chip lead. 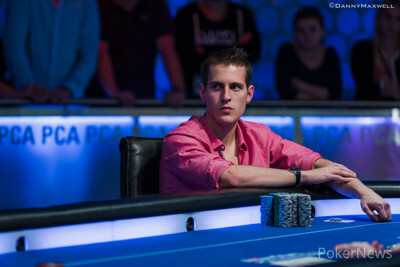 Over four hours after Ortiz exited in eighth place, Pascal Lefrancois was eliminated in seventh, earning $242,020. The French Canadian lost a race with the against Baron’s when Baron spiked an ace on the turn. An hour after Lefrancois’ bust, another Canadian, Shyam Srinivasan, bowed out in sixth place. Srinivasan three-bet shoved with the , and was in great shape to double against Panka’s , but the flop produced a ten, giving the Pole a set. Srinivasan failed to improve on the turn or river, and was eliminated. After a few interesting betting lines during five-handed play, Daniel Gamez was on the short stack. He raised with the during Level 31, Panka called on the button, and McDonald put in a three-bet with the . The Guatemalan opted to move all in for 24 big blinds, McDonald called, and the dominant hand held up. Gamez, a soon-to-be father, earned $447,040 for his efforts. Muur also decided to risk his tournament life with queen-ten, four-bet jamming for 34 big blinds 30 minutes later with the . Panka, the three-bettor, instantly called with the , and held. The Estonian earned $581,040. Panka, Baron, and McDonald immediately stopped the tournament to discuss deal, and around 20 minutes later all three players were guaranteed at least $1 million. As requested by the tournament staff, $100,000 was put on the side for the eventual winner. Play loosened up a bit with all three players guaranteed seven figures, and Baron lost a big pot to McDonald when the latter turned two pair against the former’s top pair. A few hands later, Baron three-bet shoved with the , and Panka, the three-bettor, called with the . The flop brought three spades and no kings or queens, leaving Baron drawing dead, and all the American could do is laugh. Panka started heads-up play with the chip lead, McDonald edged in front on the very first hand, and the two battled for nearly three and a half hours. The Canadian eventually extended his lead, but lost a massive flip on the very last hand of Level 33. McDonald never recovered, and during the next level he three-bet all in with the . Panka called with the , and it looked like McDonald was going to double when the turn produced a seven, but an ace spiked on the river. Congratulations to Panka, the first Polish EPT champion. He earned $1,423,096, the trophy, the SLYDE watch, and a place in poker's history books. Season 10 continues in less than two weeks with EPT Deauville, and PokerNews will be on hand to provide live updates from the Main Event and High Roller. Thank you for following our coverage of the 2014 PCA, and good morning from the Bahamas! 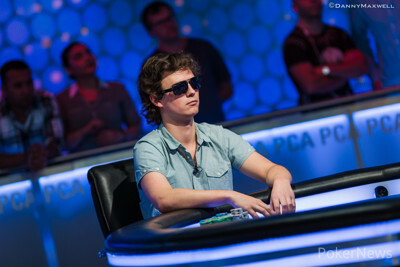 Dominik Panka raised to 500,000 from the button and Mike "Timex" McDonald three-bet all in over the top for 5.39 million. Panka asked for a count. A moment after being given the count Panka announced a call. The tension mounted in the tournament area as Panka was five cards away from becoming the first Polish European Poker Tour champion. The flop came and Panka paired his deuce. McDonald jumped into the lead, however, when the rolled off on the turn. McDonald was suddenly looking to dodge an ace or a deuce on the river to stay alive and fight on in this heads up match. The dealer rapped the table and burned a card. He produced the river card. McDonald was eliminated in second place and is forced to settle for a $1,064,865 payday. 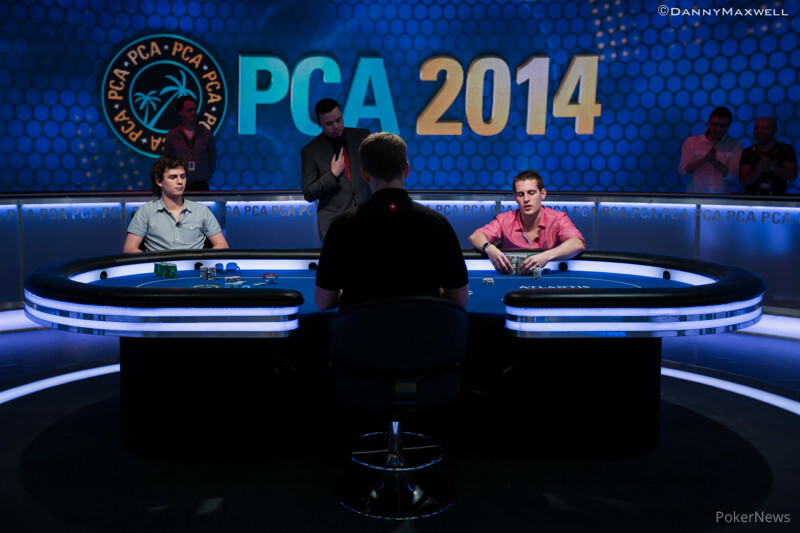 Panka was pushed the final pot and is the newest PCA Main Event champion! Dominik Panka raised to 500,000 on the button with , Mike McDonald called with , and the flop came . McDonald checked, Panka fired out 400,000, and McDonald check-raised to 1.2 million Panka called. The turn was the , McDonald led out for 1.5 million, and Panka made the call. 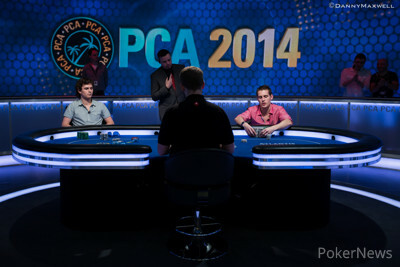 Both players checked after the completed the board, and Panka shipped the six million-chip pot. Dominik Panka held on the button and raised to 500,000. Mike McDonald called with and the flop came down . McDonald checked over to Panka and the Pole fired out a bet of 400,000. McDonald flatted and the fell on fourth street. McDonald checked the turn and Panka slid forward 1 million. McDonald kicked his cards in and Panka picked up the pot. Dominik Panka raised to 400,000 on the button with , Mike McDonald three-bet to 1.2 million with , and Panka moved all in for 13.11 million. McDonald asked for a count, tanked for a bit, then called. “That is crazy,” Ike Haxton said on EPT Live. The flop fell , changing nothing, and someone on the rail asked for a nine. "For a sweat!" the person yelled. The turn was not a nine, it was the , and only six cards could eliminate Panka. "King for a sweat?" McDonald asked, grinning. The on the river was not one of them, and the Pole doubled, flipping the script. The two are now on a short break. Mike McDonald opened to 400,000 from the button with . Dominik Panka three-bet to 1.2 million from the big blind holding and McDonald called. The flop came and gave McDonald four to a club flush. Panka continued out for 1 million McDonald called. The fell on the turn and gave Panka a pair of tens. Panka kept up the aggression by betting 1.7 million. McDonald called once more. Fifth street brought the and Panka checked for the first time. McDonald announced an all in bet and Panka let go of his cards. After winning a few small pots, Mike McDonald raised to 400,000 on the button with , Dominik Panka called with , and the flop came . Panka check-called a bet of 400,000, the turn brought the , and the pair checked. The river was the , the two checked again, and Panka won the pot. Mike McDonald raised to 400,000 on the button with , Dominik Panka called in the big blind with , and the two took a flop of . Panka checked over to McDonald who fired 400,000. Panka called and the hit fourth street, giving McDonald a heart flush. Panka checked for a second time and McDonald pushed out 800,000. Panka called and the completed the board. Panka checked for a third time and McDonald moved forward a final bet of 2 million. Panka went deep into the tank before opting to fold his hand. Everything Must Go In Our Annual January Closing Down Sale!